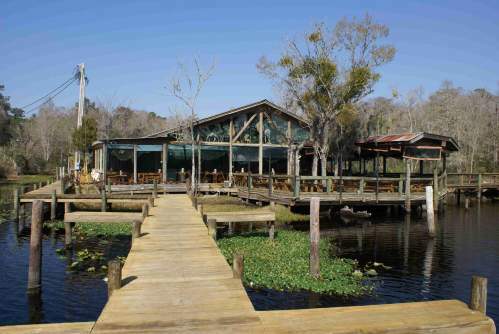 Located on Julington Creek just off the St. John’s River in Jacksonville FL, Clarks Fish Camp offers a great range of seafood dishes, as well as a few rather more exotic menu options like crocodile, gator, eel, frog, kangaroo and snake, amongst others, all jostling for your attention. 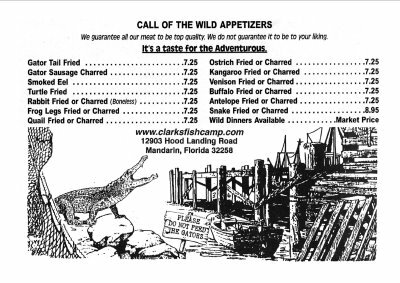 I won’t lie to you, although the outside of Clark’s Fish Camp has the reassuring homeliness that you would want from a restaurant that prides itself on Southern cooking at its best, I found there to be a creepiness to its interior that no amount of deliciously distracting alligator tail can hide as stuffed animals gaze at you from central displays rumoured to be the largest privately owned collection of taxidermy in the country and a Grandma-worthy collections of porcelain plates adorn the walls – and yet the decor can’t stop me from enjoying the excellent cooking. 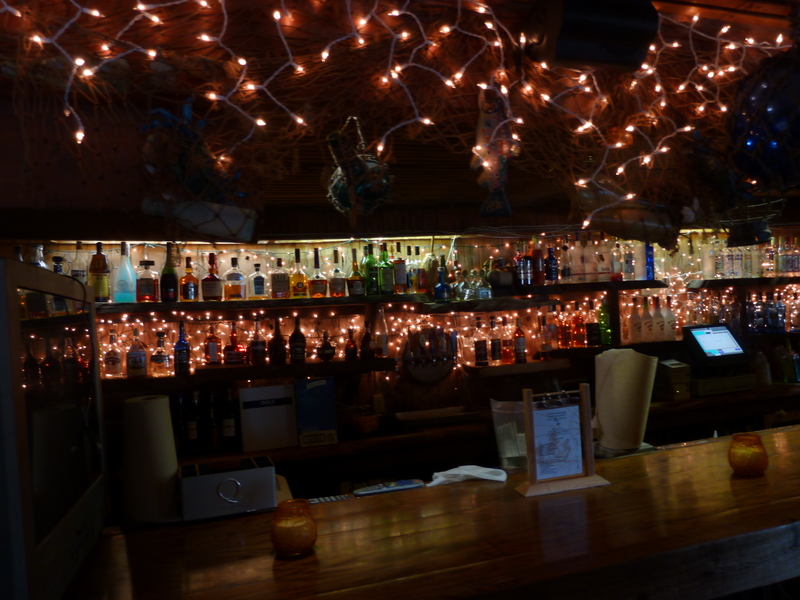 As you approach from the large and yet always full car park, you walk along the side of the restaurant past bar stools and an outside eating area, and find yourself facing the reception point next to a large and superbly stocked bar. There you will no doubt be politely asked for your details and asked to make yourselves comfortable in the bar while they wait for a seat to become available. Once your table is ready you will be lead past the reception point through a corridor walled with some of the aforementioned porcelain plate collecti on, and then on into the main dining area, where the hackles on the back of your neck will raise as you feel the eerie sensation of being watched. 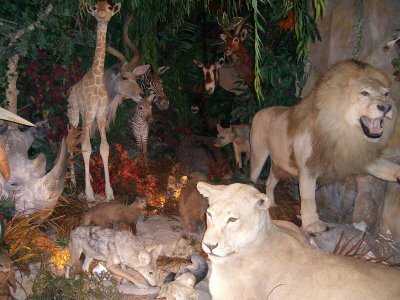 As you look around for your lurking stalker you will realise the eyes belong to the taxidermy army, laid out in increasing unrealistic settings. 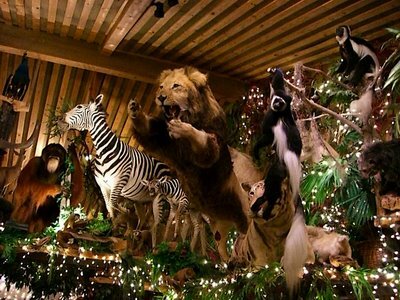 Quite why I would want to eat my meal while being mournfully observed by a stuffed lion is beyond me, but maybe I’m just a stranger to the American love affair between guns, hunting and food and am missing the point, maybe it’s a celebration of mans triumph over beast, to be celebrated by you tearing apart your meaty meal, surrounded by fallen prey. The service is a little slow but with the restaurant always being busy, and so many bizarre things to look at, I can forgive an acceptable delay. The food always arrives hot, my drinks are regularly topped up and it’s definitely an unforgettable experience.